M.E.C.’s 70-L Series low pass filters consist of corrugated or waffle-iron multi-section designs with integral impedance transformers. The internal corrugations provide low pass band loss and high spurious-free rejection of second and third harmonics of pass band frequencies even in modes other than the fundamental TE10. These characteristics make the 70-L Series ideal for precision test set-ups, where they eliminate significant errors due to high harmonic content from broadband sources. M.E.C.’s 470 Series multiplexers separate or combine two or more frequency channels into a common port and are made by integrating 70-L lowpass filters with highpass, bandpass, and band-reject filters into complex networks used in spaceborne radiometry and other multi-band applications. Two such examples are the diplexer and triplexer shown below. M.E.C. refined this technology and offers these units up to millimeter ranges, with as many as eight separate channels, compactly packaged, and with single or dual polarization. 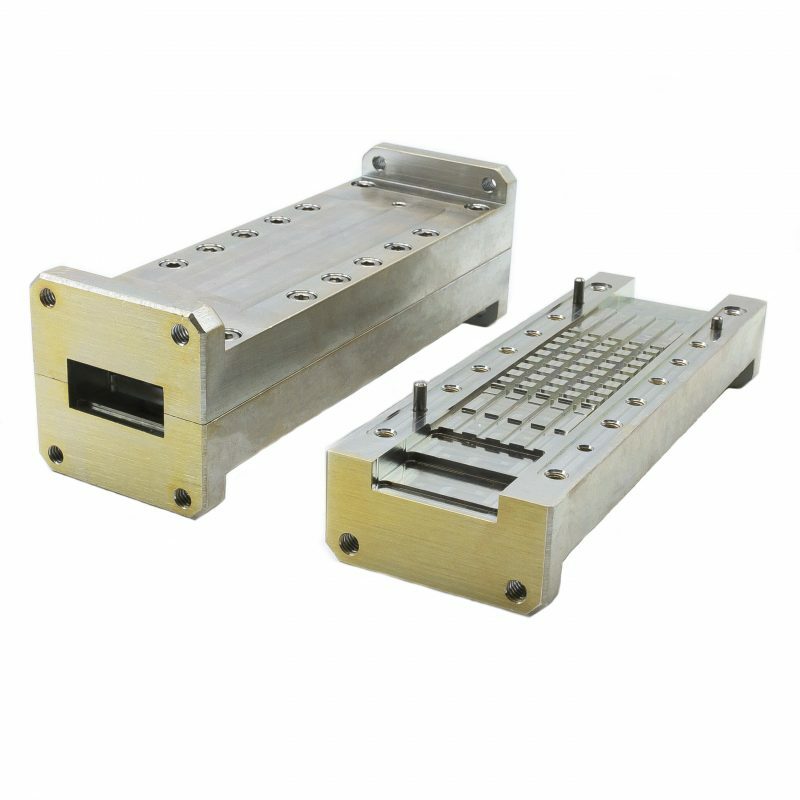 The 70-L Series models listed below cover only the most common rectangular waveguide bandwidths. They are also available in other bands and may be customized and/or combined to your specifications. Filter plate-sections are CNC-machined in Aluminum 6061 with heavy external walls for added ruggedness. Flanges are cover type with tapped holes, finish is chromate conversion per MIL-C-5541, Class 3, and paint is gray epoxy enamel. (1) For multiplexers, contact M.E.C. (2) Other waveguide bands, flanges, and mounting options are available upon request.